Sole/Ride/Drop: The sole is made of a simple EVA sole. In the past, the Type A series used nubs for additional grip on the road that fell off very quickly. 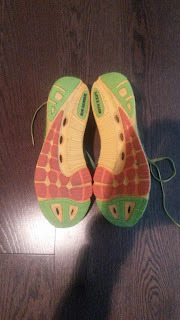 Now without the nubs and the additional EVA pads on the bottom, the outsole is much more durable than in the past. With over 50 miles I am seeing very little wear despite tough workouts and races on a variety of races. In terms of ride, this shoe is smooth. 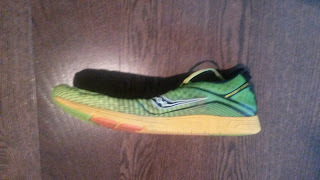 I expected the simple EVA midsole to not provide a great deal of cushion, but the ride is cushioned for a racing flat. Additionally, the ride is consistent from heel to toe, which definitely contributes to the smooth ride. The heel to toe drop is low at 4-5mm which is typical for racing flats in this range. The Type A6 also has drainage holes are a little annoying in terms of picking up rocks. They are larger than previous versions, however they still perform well on XC courses. My favorite part is that despite the lack of outsole nubs, they still have great grip on roads even after rain. Fit/Feel/Upper: The Saucony Type A6 finally fits true to size. Prior versions required going a half size up but if you are interested you should stick with your normal size for A6. The upper is smooth and disappears when you are running. The A6 has a snug fit and does fit a bit narrow. For those with wider feet, I would definitely try before you buy. Due to the narrow heel fit, which does help hold the foot very well, getting your foot in the shoe can be difficult, but luckily there is a pull tab on the heel. There have been no upper durability issues to speak of. Overall a great upper that will feel slightly snug initially and then you'll completely forget about what is on your feet. Weight/Responsiveness: This shoe is a mid 5 oz shoe and feels as such. 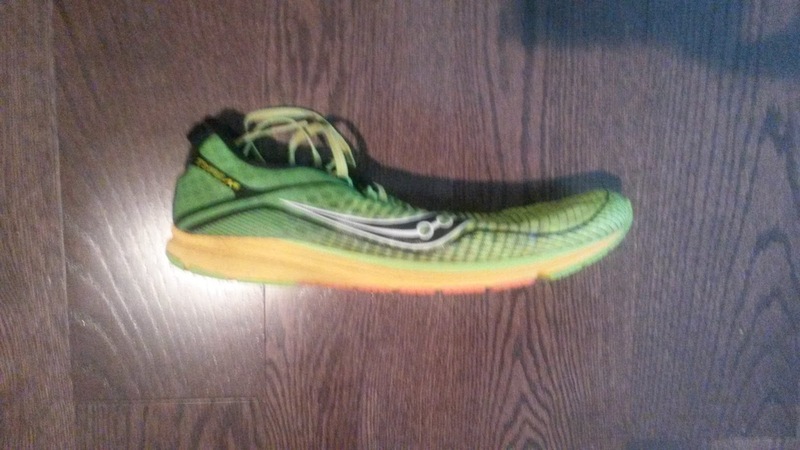 It is a responsive shoe that I have used for workouts from repeats to tempo runs. The Saucony Type A6 is meant to go fast as either a workout or racing shoe. What I found surprising was that it is also quite protective despite the lighter weight and thin midsole. I personally use this as a 5k-10k shoe and would consider using it for a half marathon. 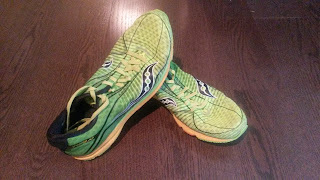 Many Saucony Elites use for full marathon and I can understand why. I personally would not. I would go for something like the Brooks Racer T7, New Balance 1400 series, Adidas Adios Series or the Nike Streak series for that distance. Regardless, know that while the shoe is fast, there is a surprising amount of cushion for such a light weight racing flat. If your feet and legs can handle it, this is definitely a shoe that could be used for a marathon. Thoughts as a DPT (Student): Saucony uses many aspects that I have discussed previously that other companies don't necessarily take advantage of for creating a stable shoe. The A6 and Kinvara both have EVA built up under the arch, which is not intrusive, but due to the pattern of EVA creates a mild feeling of arch support. It is not posting or a different density of foam. Saucony simply put a little more midsole material in the arch. Again, the feeling is not intrusive. To me it feels like a prioprioceptive cue due to the mild touch of EVA to the arch to remind some of my muscles to continue working with a little extra to cushion medial movement. Saucony does this with many shoes, especially the Kinvara series and some people may find the arch irritating but I tend to enjoy from a point of guiding the foot without forcing it to do anything like many traditional stability features do. Many racing shoes do not have the arch filled in at all and instead leave the space completely empty to save weight. This to me leaves the shoe feeling very unstable as my foot has nothing to rollover. Certain shoes get away with this like the Brooks T7 Racer (a personal favorite: Review HERE) but others like the original New Balance Minimus Road do not. Essentially if you have some pronatory issues due to weakness, you may be able to get away with the Saucony Type A6 due to the filled in arch and broader and thus more stable platform versus many that cut the arch out. A cut out arch means a narrower platform, smaller base of support and thus a more unstable platform. Kudos for Saucony for trying things! Conclusion: I did not know what to expect from this shoe after running in others with propulsive technologies (especially Adidas's Extended Torsion System). 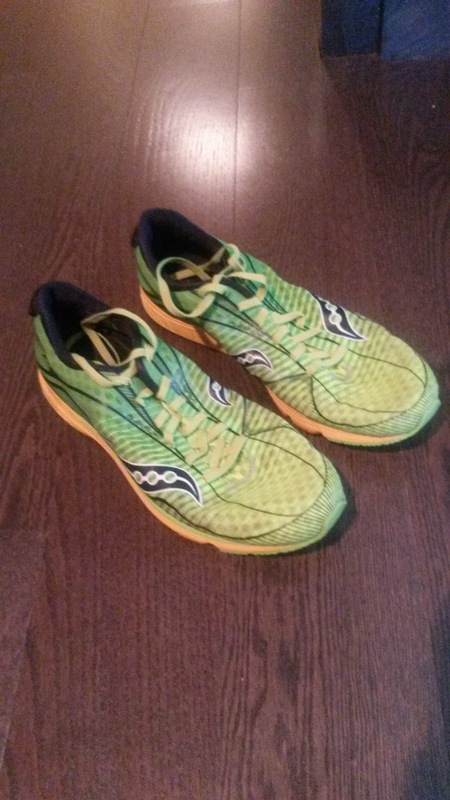 I found that the Saucony Type A6 is equal if not better than my previous racers. The upper fit is snug and disappears off the foot (also sizing is correct this time). The midsole, while simple, is quite responsive and fast while being stable thanks to EVA filling in the arch. The outsole, without the tiny nubs and instead larger rubber placement, is very durable and has decent grip for a variety of surfaces (would not suggest this shoe for aggressive XC courses or trail races though). I am very impressed with Saucony and look forward to what they do in the future! These shoes were a provided with assistance after winning the 2015 Megan's Wings 5k from Top Speed Running in La Verne, CA. I put at least 100 miles on every pair of shoes before I review them (except racing flats which I put on at least 50 miles). Currently I have 52 miles on my pair.